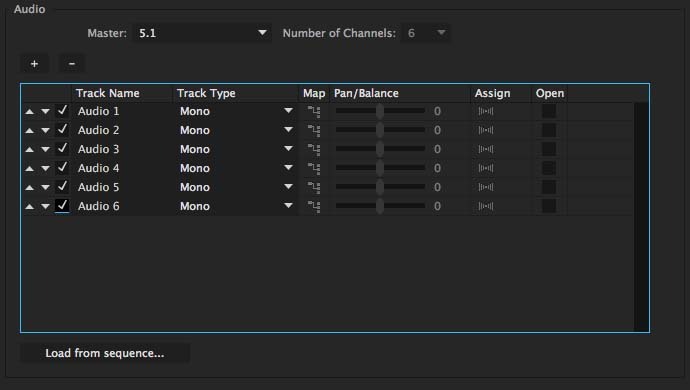 This guide shows you to how to embed up to five audio channels in a video using Adobe Premiere in a way that makes them accessible to QLab. The process here is a bit long-winded. Once you do it a couple of times, it's really quite simple and the process only takes a few minutes. 1) Open up a new project in Premiere. Set your scratch and project folders to a new (or your existing) project folder. 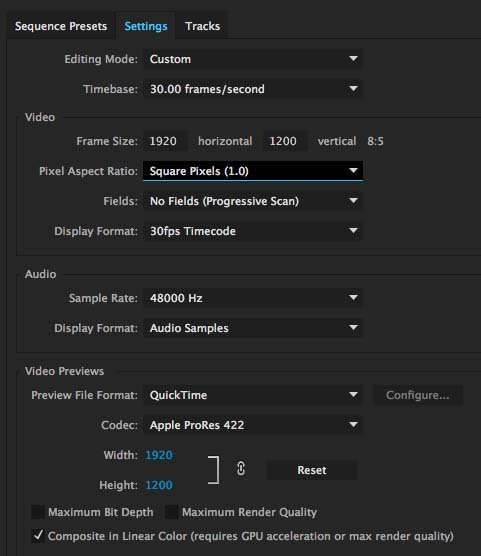 2) Import your uncompressed audio files (AIFF, WAV, Lossless, or whatever you prefer - make sure you keep your codec and sample rate the same) and video file into Premiere. Ideally the video should already be in Apple ProRes format to minimize your render time. Your final media will be Apple ProRess 422 + six channels of uncompressed audio. 3) If you have audio linked to your video already that you want to use, you'll need to separate that audio from stereo into two mono channels. Right click the Media / Clip in the Project Panel. Save this preset if you like! - Timebase: Use your media’s framerate. - Frame Size: Manually match this size to the resolution of your media. - Pixel Aspect Ratio: Square. - Fields: use Progressive unless you’re working with interlaced footage. - Display Format: match the framerate set in "Timebase." - Width & Height: Set to the same resolution that you used above. - Maximum Bit Depth and Maximum Render Quality are to your preference. Here’s an example, but your resolution and framerate may be different. TRACKS (tab to the right) - these are your audio settings. - Press the plus sign until you have 6 tracks of audio. - Individual Tracks should be set to MONO and checked off. Save that preset so you can batch things later! Press OK when you’re done and name the sequence whatever you want. - Move track 3 into CENTER (top middle)- but don’t put any audio here. For some reason - when you export, QLab reads this as between L & R, rather than a discrete channel. You can put something here if you don’t care about that, but in general it’s not worth using because it will muddy the first three channels. If you find a solution to this please revise this Wiki. 6) Drag your Media from the Project Panel into the Sequence timeline. Your timeline should look like this. If you're accustomed to mixing 5.1 audio, you may notice that channels A1-A6 don’t have a little 5.1 indicator next to them. 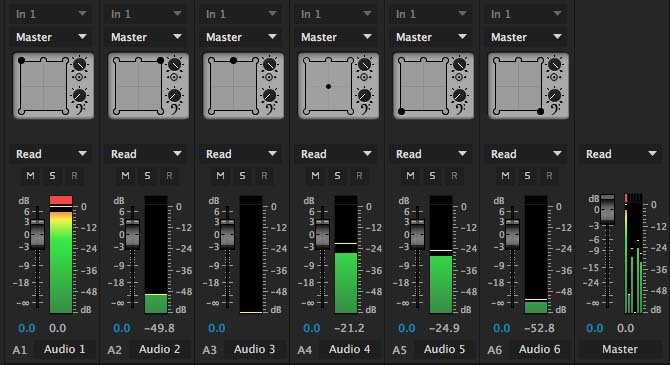 Basically you want those to read as six mono tracks and your master should read as a 5.1 track (ignore the media name and type - this is just for reference). Optional: Right click media in the Sequence and unlink it. This will unlink the two original mono tracks. Obviously if you don’t want to put these in a different track, don’t bother with this step. 7) Now modify all of your audio assets in the project panel into mono. That way you can throw it into this sequence and "patch" it in the correct channel. This is what it should look like when you press play, notice that there are 5 discrete levels in your Master (far right). Mute the channels one at a time and you’ll see the Master reflect that. - Set resolution to be the same as your source. - Set frame rate to be the same as your source. - Field order - same as what you set earlier - probably progressive. Save this export preset if you like! Bring your new media file into QLab and adjust your crosspoints to your liking. Done!